WINDSOR, Conn., Jan. 3, 2017 /PRNewswire/ -- Voya Financial, Inc. (NYSE: VOYA), announced today that it has launched two new television commercials as part of the company's Orange Money integrated marketing campaign. The ads highlight the importance of getting organized today to better prepare for retirement tomorrow. The new commercials are a centerpiece of Voya's 2017 integrated marketing initiatives, which will be supported across various channels, including digital, mobile, search and social media. Voya's origami Orange Money animals, "Val" the squirrel and "Vern" the rabbit, are growing in popularity and return once again to serve as creative metaphors for positive retirement planning behaviors. Val and Vern represent "Orange Money," which is the money that one needs to set aside for retirement. 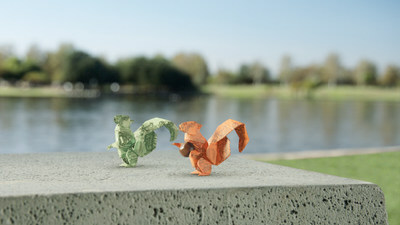 The latest commercials introduce origami animals made from "green" money, representing the money used to support an individual's current daily living expenses. "We are building on our Orange Money creative concept, which highlights the importance of getting your finances organized and saving early," said Paul Gennaro, senior vice president, Brand and Corporate Communications, and chief communications officer, at Voya Financial. "We're also helping consumers distinguish the difference between the Orange Money that they should be setting aside for retirement and the green money that they spend to support everyday needs. Our goal is to underscore the significance of managing and saving Orange Money today to be better prepared for tomorrow." The new commercials will air on a wide range of news channels, lifestyle networks, cable properties and high-profile sports programming such as professional baseball and football, collegiate football and basketball, and broadcast coverage of popular tennis tournaments. They will also serve as online videos supplementing the broader Orange Money campaign assets running across digital media channels. The first spot, "Park Bench," debuted Monday, Jan. 2, and the second will follow in the coming weeks. The Orange Money campaign was introduced in 2013. The concept has been leveraged to develop Voya's myOrangeMoney® interactive educational participant website experience, which is helping millions of Americans change the way they manage and engage with their retirement plan. As an industry leader and advocate for greater retirement readiness, Voya Financial is committed to delivering on its vision to be America's Retirement Company™ and its mission to make a secure financial future possible — one person, one family, one institution at a time. Voya Financial, Inc. (NYSE: VOYA), helps Americans plan, invest and protect their savings — to get ready to retire better. Serving the financial needs of approximately 13 million individual and institutional customers in the United States, Voya is a Fortune 500 company that had $11 billion in revenue in 2015. The company had $480 billion in total assets under management and administration as of September 30, 2016. With a clear mission to make a secure financial future possible — one person, one family, one institution at a time — Voya's vision is to be America's Retirement Company™. The company is equally committed to conducting business in a way that is socially, environmentally, economically and ethically responsible — Voya has been recognized as one of the 2016 World's Most Ethical Companies® by the Ethisphere Institute, and as one of the Top Green Companies in the U.S., by Newsweek magazine. For more information, visit voya.com. Follow Voya Financial on Facebook and Twitter @Voya.